This pilot-scale facility was developed to incorporate and demonstrate the capabilities of using the patented FARADAYIC Process to deposit or etch copper for printed circuit board applications. ST. LOUIS, MO - Viasystems Group, Inc. (NASDAQ:VIAS) and Faraday Technology, Inc. are collaborating on demonstration of the FARADAYIC(R) ElectroCell technology for the manufacture of printed circuit boards (PCBs) with high-density interconnect features and at high plating rates for improved productivity. The patented ElectroCell technology has been shown to plate copper features rapidly with greater copper uniformity than achieved with the standard plating cell geometries used throughout the industry today. Dr. Craig Davidson, Viasystems' Vice President of Engineering and Technology, stated, "Improved thickness uniformity across the PCB translates to improved capability to fabricate complex features with higher quality and reliability as compared to baseline processes. It also provides productivity improvements, which reduce costs." 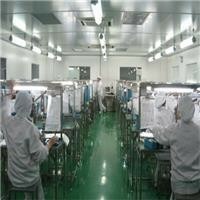 This work exemplifies Viasystems' commitment to customer satisfaction through advancements in manufacturing technology that increase capability, improve quality and lower the costs of PCBs manufactured by Viasystems. The FARADAYIC(R) ElectroCell technology is a drop-in technology, anticipated to streamline implementation and reduce costs traditionally associated with incorporation of new technology into existing manufacturing lines. Dr. E. Jennings Taylor, Faraday's founder and Vice President, said, "The tank design, including all tank components, is a drop-in replacement meant to cost-effectively address the continuing miniaturization and sophistication of PCBs for current and next-generation electronic modules." Funding for this work was provided in part by the United States National Science Foundation through the competitive SBIR program with the goal of advancing and strengthening the United States' manufacturing sector. FARADAYIC(R) ElectroCell: US Patent Number 7,553,401 (6-30-09), pending Divisional Patent, application number 12/431,030 (filed 4-28-09) and pending Continuation-In-Part, application number 11/836,903 (filed 8-10-07). 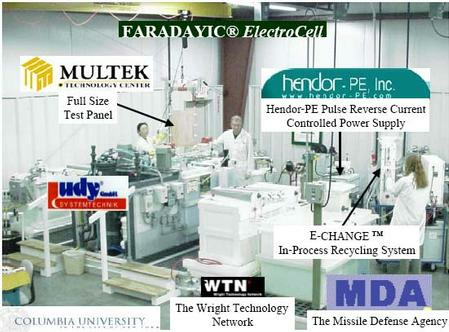 Faraday Technology, Inc. in Clayton, Ohio, was founded in 1991 to develop and commercialize novel electrochemical technology. The company's core competency lies in the management of the innovation process from concept to pilot-scale. The company also manages the intellectual property assets developed from the application of the FARADAYIC Process to provide its customers and strategic partners with strong, competitive advantage. Unique in its approach, Faraday provides customized, scalable solutions for specialized problems in edge and surface finishing, industrial coatings, advanced electronic interconnects, monitoring and mitigation of corrosion, effluent recycle and recovery and power generation.